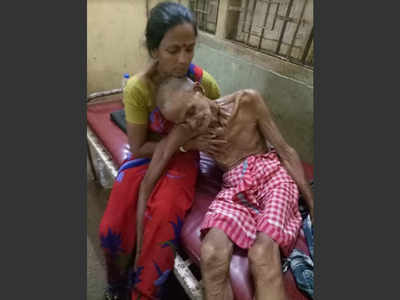 One-hundred-two-year-old Chandradhar Das, who spent almost three months in a detention camp, was released on bail on Wednesday by the Silchar-based foreigners’ tribunal in Assam’s Cachar district. A TOI report stated that the tribunal vacated its earlier ex-parte order that had declared Das as a foreigner. Nevertheless, Das has to appear before the tribunal and can contest his case by filing a written statement and will have to buttress his case by submitting relevant documents in support of his claim as Indian citizen. This information was given by Das’s advocate, Soumen Choudhury. July 4 has been fixed for submission of written statement. The frail looking Das is afflicted with multiple old age ailments including difficulty in hearing and memory loss. The Barak Valley-based Unconditional Citizenship Demand Forum (UCDF) was moved by the “miserable condition” in which Das had to spend the “fag end of his life” in a jail converted into a detention camp along with other detainees and had, earlier on Wednesday, met the Cachar Deputy Commissioner, Lakshmanan S, and raised Das’s case. Das, a resident of Borai Basti in Barak Valley’s Cachar district, and who possessed a citizenship card of 1966, was declared foreigner by an ex-parte judgement of the tribunal on January 2 last. Das was sent to a detention camp in March this year. Recently, social activist Harsh Mander had resigned as the Special Monitor at the National Human Rights Commission saying “there is no constructive role” for him to play. He said that he had authored a report on the critical question of people declared as foreigners in Assam, but the Commission “paid no heed to it”.